Jack L. Salts, Born in Lafayette , Indiana in 1938, Jack was the oldest of eight children. After graduating Jefferson High School , Jack joined the United States Navy and trained as a Navy Corpsman near Seattle , Washington where his oldest son was born. He was then admitted into the UDT SEALS and started his training in Norfolk , Virginia where his second son Richard was born. Jack then left for the first of two tours of Viet Nam where he was a platoon leader in the elite commando fighting forces of the Navy Seals. Jack’s nickname was Doc, and he was greatly admired as an excellent corpsman and SEAL operator. One need only take a quick glance at his large cache of medals and ribbons to know that the Navy held him in high regard. It was during this time that his third and fourth sons were born. After his second tour of Nam , Jack became a Seal team instructor in Coronado , California . His children remember fondly the times watching him parachute out of airplanes guiding dozens on new SEAL recruits to the awestruck families below. Just as well, we remember his absence during “Hell Week”, the infamous make or break week for SEAL recruits where two or three hours a sleep in three days is considered a luxury. Jack was an avid sports fan and had a memorabilia collection that reviled many sports memorabilia stores. He held season tickets to the San Diego Chargers but baseball was his favorite. He was an excellent umpire for SDBUA and loved talking about his favorite team, the 1955 Brooklyn Dodgers. He made sure to take his children to more padre games than they ever could have dreamed for. During Jack’s “spare” time, he served as two-time past president of the Fleet Reserve Association branch 61 in Chula Vista , Ca. Jack also owned Jack Salts Realty in Chula Vista after his 22 years of service to the country were finished. Later, Jack became the doorman to the world famous Hotel Del Coronado greeting some of the most famous dignitaries in the world. It was during this time that President Clinton’s staffers asked him to be part of the president’s motorcade. Jack is survived by his four sons: Greg (Febie), Richard (Necole), John (Dawn), and Matthew, his father George and his mother Alberta, his stepfather Russell, sisters Beverly, Linda, Debbie, and Diana, brothers Mark and Mike, and seven grandchildren. operator. Please give him my best. Your Dad WILL be remembered as a great Corpsman, Seal operator & Friend. I would never have anything but the best to say about him. We are all better for the opportunity to know & serve with him. I am so sorry to hear about his condition. Please accept our condolences to the Family. appreciate it, see you at the OS&F. I understand that you have a dad who is?swimming hard but the surf?seems a little too high.? Please let him know that the Seals are praying for him.? And?we are strong and expreienced prayers! I just read the post on the PML and wanted to check in. I served with Jack at UDT 22 Little Creek. We found a floating rock while on a night op in the Med. One of those things you do not repeat. I didn't till now. Call or email me if you are up to it. I knew you Dad well. He is a good Team Mate and a damn fine Corpsman. He once came to my house on a weekend to treat me for an emergency penicillin allergy reaction. Like many of us will be soon, he's on his last patrol, but to a better place. God Bless Him, you and your family. area to the north of us. I went there several times. am sure there are a lot of SEALS there that also worked him. and remembered by those that were fortunate enough to serve with him. By the way, what is a floating rock?, is it just that??? Yes, Just that, a rock that floats. We shared amusing comments about the consequences of reporting such a find. Our credibility took priority so it was omitted from the report. Sorry to hear about your dad. I served with your dad for many years in Seal Team One and worked with him in Real Estate for many years. He was and is a good friend, please keep me informed. Give him my best. after we retired we were in the real estate business togather. As a matter of fact Jack worked in my office. I rember Judy. My wife Faye was most sad to hear the news. Your father was a good man Richard please never forget that. We are here if you need to talk. My phone no. is 623-330-3343.
is awaiting with other team guys on the other side with a beer in hand. corpsmen, HMC retired in 1972. I was on UDT 21 and Seal Team 2. I am so sorry to hear about Jack and his condition. My wife is also fighting the same thing. Please convey my prayers and best wishes to Jack and to all of his family. It is a terrible thing for a family to go through and I pray god will help you do this. better than that great body he had in the Teams. what Jack taught me has helped me through out the years. I am sorry to hear about your father's condition but happy to hear he is comfortable. 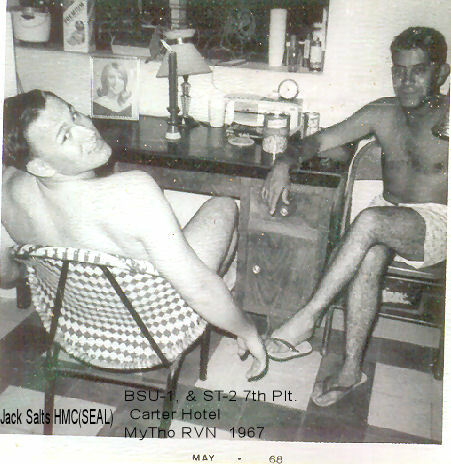 I first met HMCS Salts when I went through BUD/S and had the pleasure of working with him many times over the years after that delightful BUD/S experience. Your father was a great inspiration to me and gave me the guidance that I required to become another in a long line of highly qualified and respected SEAL Corpsmen just like the old Salt himself. I will send him a note in the US Mail today and will pass on my best regards. By the way, there is no doubt your Dad had a long and illustrious career in Naval Special Warfare and was highly regarded and respected by many. Best wishes to the Salts Family in these trying times. my own father and mother during their time of passing. Frogmen. That's the way I see it, Richard. your family. He alone is mighty to save and nothing is impossible with Him. If I can render any assistance then please don't hesitate to contact me, sir. "The LORD is righteous in all His ways, and holy in all His works. I am sorry to hear about your father. I am glad to know that he is in a good facility. I was a SEAL for about twelve years and am now a pastor in Valley Center (just north of Escondido ). Please let me know if I can be of service to you or you family during this time. I would be happy to serve however possible. I am Master Chief Steve Giblin, a SEAL currently serving at BUD/S and would like to let Jack know that his generation’s legacy in the team's lives on. Today's generation may be worlds apart from the one Jack grew up with but they are the same in their dedication, will and desire to serve their country in a time where most will see combat in their first tour overseas. These young men continue to push themselves to new heights in personal achievement and strive forward in the teams to eventually become leaders of hardened combat veterans, much like Jack and the frogmen of his era. understanding that these men had shared something nearly indescribable. I will keep your Dad and all of you in my thoughts and prayers. You don't know me, however, you might know my grandpa... Elbert "Boom Boom" Schloesser. My grandpa was WWII, Korean, Vietnam era's. I wish you and your family the very best!!! Thank you for everything that you have done!!! It is very much appreciated!! Spoke about Jack at length with Judy last night. What a great way to remember your Father, by sharing everyone's emails. I've never seen it done before, but it is truly touching to read about him. Brought tears to my eyes. I remember him fondly; recall his pride and his great pleasure, when he and Judy married. I recall meeting you and Richard when you were so little and shy. He was so proud of you both. You both have much to be proud of, to have had Jack as your Dad. Then along came John and Matthew and it became one enormous testosterone driven family. Judy had her hands full, but she loved her life and all her men. She really loved Jack and NEVER gave up on him in her heart, even when he gave up on himself; she was always there for him. That's Love. it's more valuable than money in the bank. To be rich in love is true success. Jack had that. Tonight, I was going to go down to spent time with Mum, but Judy really has her hands full. I am here for her if she needs me for anything, she knows that. She is being her usual stoic, strong self, handling everything and everybody so well. Judy is a remarkable woman, but even she is human and needs all the support and strength and love only 'her boys' can give her during this awful time. Also, please let me know if there is ANYTHING I can do, which Judy may overlook. My thoughts and love are with Jack and Judy, Greg and Richard, John and Matthew. Please pass this on to Doc. I have often wondered where you went. I am happy to hear from your son, that you are resting comfortably in El Cajon . You were the heroes of the old SEAL teams and the ones that we forever looked up to. Good luck in your future endeavors and give our guys a big "Hoo Yah". Hi! To one of HMC Salts sons. I didn't work with your dad directly, but knew of his good work. Losing of family and friends is not an easy thing. Subject: My Teammate- My mentor! Hi Jack, err should I say Chief Salts! How I will never forget your positive leadership and example as a role model during my BUD/s Class 80. You sure made an impression on our class and me... especially ME! I'll never forget your fatherly love to inspire and motivate as you often did when I was in the push up position. How my body ached and yearned for your few words that inspired leadership and provided guidance while I was in the lean-n-rest. Only after making me knock out the twenty set of pushups 2 or 3 times did you finally provide the words of encouragement and unforgettable motivation that I was seeking. You’re few choice words that were spoken softly but firmly were greatly appreciated. The words… “RECOVER PISHDAD” was received with great anticipation and true admiration. You guidance and leadership was truly remarkable as you stood tall and fast while I shivered uncontrollably in the surf zone was another example of the talents that you made sure my class and I would never forget. It was during periods like this that you taught me the meaning of perseverance, dedication and teamwork. Yes, while I endured the freezing Pacific Ocean surf zone for what seamed like hours on end, your unwavering determination to ensure each member of my class clearly understood the values that are required to be a Frogman, are forever embedded in my mind. In fact, I often reflect on moments that you took personally to ensure that I clearly understood the obligation that I was volunteering. And it was in-part to your leadership, your direction and your determination and your ability to stimulate extraordinary “SPIRIT” in our class was highlighted when you helped to motivate our Class 80 to be one of the only classes that had a NO-BELL Hell Week. Yes Jack, thanks to you, I am a much better person. I have unquestionable determination, unending perseverance, the true understanding of the meaning of TEAMWORK! I am forever in you debt and thank you for not only being one of my instructors but for being one of my TEAMMATES! Jack over my 20 years serving the TEAMs, your presence continued to inspire and motivate. Clearly your love for the TEAMs and our country has been unquestionable. When you ruled at the Hotel Del Coronado, the mere mention of your name made many of your trainees tremble in their shoes. It seamed like just the mention that I knew you was all it took to open doors of opportunity. Thanks! I am in awe to your sprit during this the recent months of enduring health issues. Again, each time I have recently seen you, I see your smile, which warms my sprit and demonstrates your unending perseverance. Lastly Jack, in all sincerity, you were a mentor to me, you have always inspired me and your friendship has been greatly treasured. It is not often that words of personal affection are conveyed between men, but in the TEAMs it seems to be an unspoken given. I want you to know Jack that I love you and will never forget what you have taught me and the values you have impressed upon me. Your son has made my friendship and I see much of your character in him. You must be very proud of him too. run. It all worked out great. was how he loved you all. Austin Texas about 2 years ago. John Hunt and Nick Nolt at the leaning Tower of Pisa . want you to know that it shows what a great individual you truly are! Tell your Dad and I went through jump school together. We also served together in BUDS. Your Dad was a true warrior and hell of a good SEAL. Tell your dad that he was always there when I needed him and tell him we had fun talking old war stories in the VFW. Jack was always there to cover your back. Tell him thanks for everything he did for me. It was Delta Platoon's pre-deployment training. Like other Seal platoons preparing to go to Viet Nam in 1969, both new and old Seals came together to learn how to form a small combat unit. Delta Platoon was being sent to the city of Rach Gia down in the southern area known as IV Corp. Our Lieutenants were John Short and Mel Hetzer. Jack was a Corpsman First Class, assigned to our platoon and in no time, won our respect for his medical knowledge and his great sense of humor. Jack has a special laugh... more correctly... a cackle... that made people smile when you heard him laugh. There was always an air of mischievousness floating behind twinkling in his eyes as Jack shared stories... and even when he was being serious. I was always waiting for the punch line. As a maturing platoon, we had already been out in Niland for small unit tactics and live-fire drills in the desert. We forded streams, practiced Helo insertions and extractions. We fired every type of ordinance we carried. Delta Platoon separated into two, 7-man squads. Jack worked with Lt. Short while I was assigned to the other squad with Lt. Hetzer. Fortunately, both squads still met every day in the training drills, and if time allowed, we would find some cool place at night to find a cold draft and tell stories about the training we just finished. Later, we were sent to Camp Pendleton for "Field Medicine Training" (FMT) and it was there Delta Platoon jelled into a tight unit. Everyone had put in the time, worked hard and we thought we had a good feel for how each person in the platoon would perform under fire. We thought we knew each other pretty well. When Delta Platoon reported to FMT, our uniform of the day was "Summer Whites". Unlike our usual green fatigues, we felt like standouts on that Marine base wearing all white uniforms with the traditional bell bottoms and Dixie cup lids. The Marines that shared the chow hall with us were also in training, and it was made clear at this training that the Marines run a different operation than the Seal's unconventional method of operation. As Seals, we respected the Officers in charge of our units, but we had more of a personal relationship than the poor Marines who were constantly screamed at by their DI's. Watching times like this, we Seals learned to appreciate the specialness of being a Seal. Unlike the men in other services, we were treated with a healthy respect by our Officers and Petty Officers. Even the Marine DI's were respectful of us. All this info was only shared to setup the retelling of my Jack Salts story. Jack's story was contained within the FMT a Marine Doctor would share with Delta Platoon over a week's time. No one but our Platoon was in this training... 14 sailors vs. 1 Marine Doctor. With those odds, someone should have known it would not go well for the Doc. Maybe this would become a turning point for inter-service cross training... I don't know. Monday morning started out with several old black and white movies, filmed during the Korean conflict. They showed us all types of battle wounds. Gunshots, explosion injuries, amputations, and every other type injury one might see on the battlefield. For us new Seals... those of us who had never been "in country", the graphic reality of what we'd got ourselves into, had never been more clear. You had to be brave just to watch those movies. Our saltier PO 's and Lt. Short, were pretty unmoved by all the video gore. They'd seen the movies before, and we believed, some real life injuries already. I seemed they were more interested in watching the reactions among us new guys. The next day, Tuesday morning started out interesting. 1st Cass PO Gruber had mentioned to all of us in our platoon that he'd been out a bit late the night before, "having a brew or two at the Naval Amphib base's Acey-Duecy Club". I sat in the desk next to where Guber sat, and remember he smelled like a brewery. His red eyes were having a difficult time staying open. I saw Corpsman Jack slip Gruber some antacids to settle down Gruber's upset stomach and some aspirin for his headache. The Marine Doc started Tuesday out with a movie... grosser than those we'd already seen. I think it was the movie on stomach injuries... intestines falling out of some poor guy, and some corpsman trying to hold all the guys guts in. As the movie started warming up, Jack Salts starts cackling... and then out right laughing. Now don't get me wrong here... Jack was no sadist; I figure he simply wanted all of us to know he had bravado even in the grossest times. Like an infection spreading, our whole platoon started shucking and jiving, until we had a full-on roar of laughter going on. The Marine Doc turned the movie off and the lights on... with a kind of quizzical look on his face. (I don't think he'd experienced anything this inappropriate in the past.) Before he was able to address what was on his mind ...at that instant, PO Gruber, still sitting in the desk, leaned over into the isle between our desks and puked out a quart of sour, day old beer. Our platoon’s laughter increased. The Marine Doc attempted to regain control of us, and pointing at the puke, said that these type of movies often caused this type of reaction. Jack's laughter grew louder and it took probably two minutes before we began to settle down. It became clear the Marine Doc misread what was happening completely. Class was stopped and we all went outside while some poor Marine recruits cleaned up the puke. To-a-man, everyone in Delta Platoon had experienced something else at that moment that added to the bonding of our platoon... weird... yes... but pretty funny in sick kind of way. Tuesday ended with the Marine Doc telling us that on the next day, we would all have to draw blood from one another. This information was discussed among us as we drove back to the Seal area. Corpsman "Jack" told us it was no sweat. Wednesday, as it would turn out, would become the "day of infamy" for Delta Platoon training. Somehow, the Gruber puke out had taken the sensational edge off the graphic scenes we'd been watching. After watching the 5th amputation, nothing seemed too shocking anymore. It always felt like someone was going to start laughing again. The whole platoon seemed relaxed, almost bored... and I was to learn later, boredom meant trouble. The morning class had the usual movies, but also included one showing us how to stick needles into another persons arm to find a good vein to establish a lifeline for blood expanders or IV's. Corpsman Jack was helpful and encouraging all of us as we learned the unnatural procedure of shoving a needle into another persons arm. Jack worked right along side the Marine Doctor, going from person to person, watching us as we drew a syringe full of blood from one another. 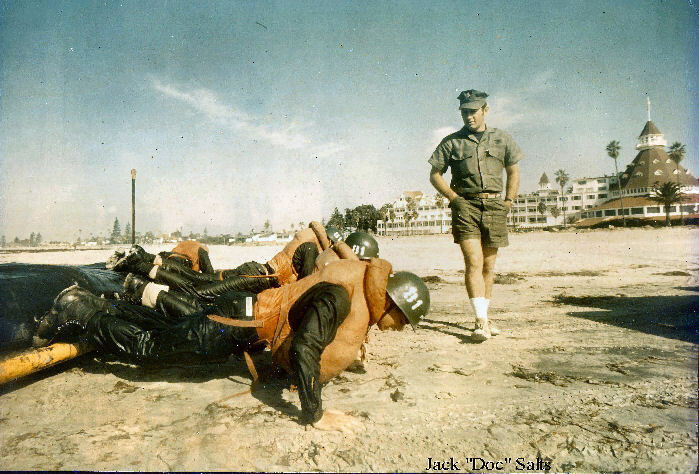 The Marine Doc was so comfortable with how Jack was working with us; he left the classroom under Jack's direction. I can't remember how it started exactly, but I think it was Bob Morris... extracting his needle from Pete VanFleet's arm, forgetting to take his thumb off the plunger. When the needle came out of Pete's arm, Morris accidentally squirted about a cc of blood onto Pete's white uniform shirt. Pete reacted so vocally, everyone in the class saw the mess on his shirt. Corpsman Jack probably should not have laughed, but he did. I guess we all kinda laughed at Pete. It was Pete's turn to take blood from the next guy, and it was then we learned he was not going to be the brunt of anyone's laughter... and not get even. As Pete pulled his syringe out of the next guys, his blood intentionally went sweeping across the classroom, spraying his guy, Jack (who was really laughing by now) and couple of us other guys. Really unfortunate... because all of us had already drawn blood and had our full syringes setting right there on our desks. It took several minutes for us to act serious again. The Marine Doc told us he would be making a full report. Lieutenants Short and Hetzer had to leave the room with the Doc to work it out with him to drop his report. Of course a minute later, Hetzer came back in, and unable to stop smiling, told us in his sternest voice to clean everything up... and to quit laughing. We cleaned up and class ended early that day. The rest of the week at FMT was uneventful... at least not memorable. Funny though... as the platoon deployed traveled to and from places, any time I was with Jack Salts, I had the memory of his wacky sense of humor and his great laugh. This was just a few moments I remembered in Jack's career as a Navy Seal. year or so later, Jack also reported in and was also a platoon corpsman. me drive it around a little, it was a dog, but it got good mileage. SEAL Tm ONE Platoon that Doc was in. in Guam during our USAF flight layover enroute San Diego . it came to be found out. me and whisk me away to the Naval Hospital there in Guam. Was packed in ice for about 2 hrs after I got to the hospital. & finally got back to ST-1 in Coronado about 3 months later. so I paid off the taxes and sold the property and made about $28,000. And your peerless work in SEAL Team ONE will not be forgotten......EVER. Saw your message from the UDT SEAL Assoc. I don't have any sea stories to relate (your Dad went to the West Coast about a year after I arrived at the East Coast Teams in the mid 60's) I wanted to let you know what a pleasure it was to serve with your Dad. He was a good corpsman and team member. I realize he may not remember me, please say hello to him for me. really tough thing to deal with. Chuck Owen I knew your dad I was a LT.
Greetings in Jesus name hope you're in the best of health and your family, as well as you dad. your father was suffering Alzymer's disease, right? that is very common for those elderly patient starting in their 70's up. most of them are very reluctant to listen and very forgetfull even his own name and his family. they're vbery susceptible in differnt illnesses because of their less food intake. don't panic bro, trust God, He will watch over your dad and undertake everything. your dad needs somebody that can truly understand his situation. just live it to God< He's able to help him, okey? send my regards to you and febie and of course give my hugs and kisses to hanah. God bless you all. I knew Jack Salts well when he was with UDT at Little Creek and also when he was in SEALs, he was one of my very good friends. Last I saw him was when I visited Hoss Kucinski in Panama City FLa when hoss was in hospice care. Jack looked great then and that is the picture i got in my mind of him. 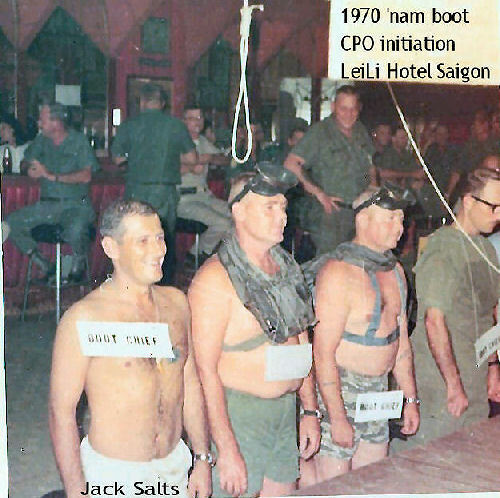 BTW: I was there at the Lei Li Hotel in Saigon and helped initiate when he made CPO.we let him have it ! both barrels ! Good old days! I do not believe they do that kind of initiations anymore. We are going in line with Jack spending the better part of his career at NAB and Working at the Hotel Del and his Catholic backround. These were all in his wishes only he just wouldn't want anyone to make a fuss about him. 684 S. Mollison Ave. El Cajon,CA 92020. They will go with Jack when he is transported to NAB. But he IS now in that great Lily Pad Pond in all it glory. Jack and I were good friends. He came to me when his wife decided to leave him and the boys in '67 . The boys were young and it devastated Jack. I had first known him from DSDS in Washington DC, he was in the next First Class Diver class with HMs after I graduated in 64-65 class. I went back up to requal later that fall and stayed with Jack, he was finishing up at that time and after completing the other courses was assigned to UDT22. Later, when I went through San Diego, we would get together usually with McCutcheon and Lloyd Shrier. I think Mac worked for Jack in real estate after they retired. It is very sad to see our numbers shrinking. By our numbers I mean the Corspmen who came from the fleet and did all the things (and more in many cases) that was supposedly meant for the graduates of UDT training. We endured the nonsense of some SEAL quasi-operators telling us that we "were only corpsmen" when we completed more patrols and gun fights than a few of them. In the teams a few guys they strutted like peacocks because they had made it though a training class; Because we, as Corpsmen, denied orders to UDT training class. I know you tried and I tried to get into a class but because we were considered non combatants and unable to be assigned that Frogman NEC we were denied. Jack among other HM's proved that we had the mettle to be SEAL Operators without reservations. We are the guys, going to Washington DC that made it possible for the HMs to get the full package and respect that we were often denied. Jack Salts and many others of that era made it all possible. He was a pioneer seeing and training Corpsmen go through BUD/S as it should have always been from the very begining.